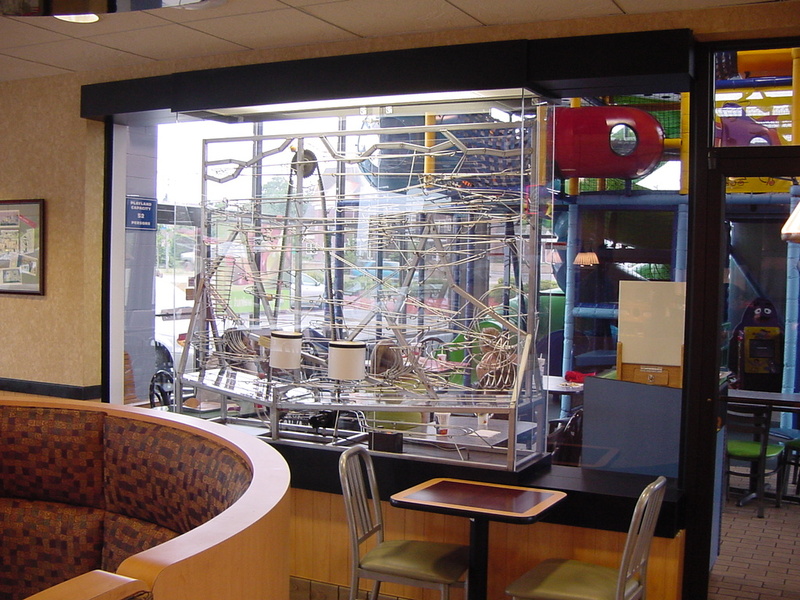 In many McDonalds restaurants, a wonderland of colorful tubes and playful gadgets calls children beyond the dining area and into the play place. Commonly, these two areas are separated by a drab glass wall. 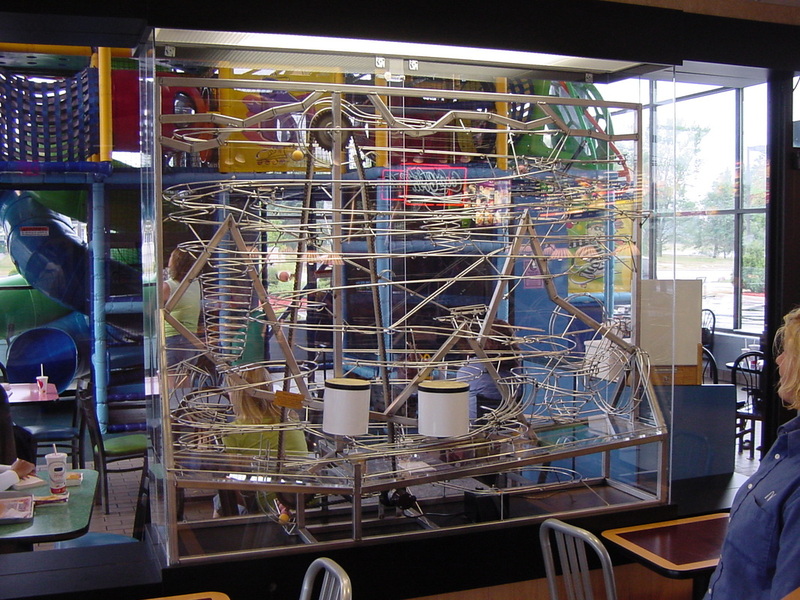 The McDonalds in Oak Creek, Wisconsin decided to change this by including one of my sculptures in the partition between the dining area and the play place. This sculpture is completely enclosed in an acrylic display case that is part of the glass partition. The sculpture runs continuously during business hours, and features five track switches feeding six different tracks. 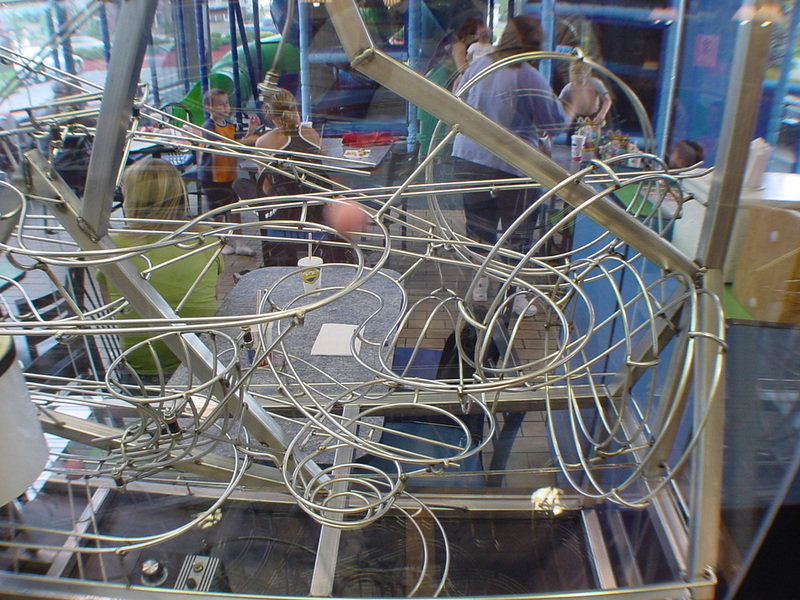 The features include multiple loop-the-loops, double bongo hop, ball jump, swinging arm, large spiral, and meandering tracks. The collection surface is made of clear acrylic, which continues the clear theme, and allows the viewer an unobstructed view of all the parts. If you look closely at the structural elements of the sculpture, you can see an image as if looking through a window. The display case was built specifically for this sculpture during the restaurant's renovation. I determined the exact dimensions of the sculpture and worked with the builder to create the correct style of display case. During installation, the sculpture simply slid into the space exactly as planned. This is a testament to the quality craftsmanship of the display case, and good planning prior to installation. The sculpture was installed in July of 2005. Can you follow the path of all SIX inversions on the single track? Follow the down-sloping track that enters from the top left of this photo. 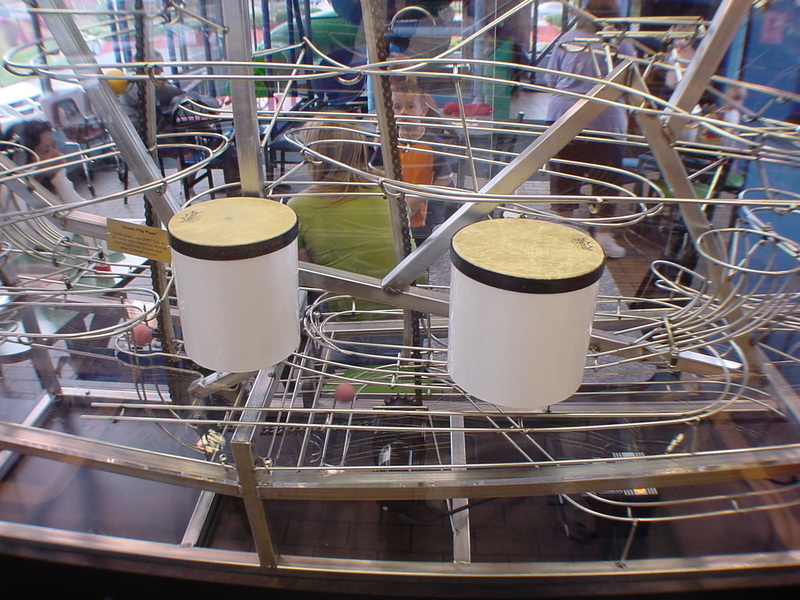 Kinematic Playplace has many acrobatic track elements, one of them being this double drum hop into a basket. By layering the switches, some track elements, such as the double bongo hops, occur only once every four minutes. Because of this delay, many times the viewer may not always see the track event happen. This feature really makes people sit and watch, waiting to see everything happen or simply to wait around to see their favorite element happen again. By far, the most rewarding part of building and installing a rolling ball sculpture is watching the people of all ages enjoy it. At times, I receive great e-mails from fans who love the sculptures. Here is one of the best responses any kinetic artist could hope to read. My name is John and I am the father of a 6 year old autic son. I just want you to know that we had an opportunity to see a piece of your work at a local McDonalds here in Oak Creek Wisconsin. My son does not speak and has always been fascinated with anything that moves or rolls. Normally we go to the McDonalds to play in the playland. When we went the other night and saw your creation, he was mesmerized. He did not play in the playland, but watched the balls for an hour. When we returned home he disappeared to his room. He later came down and walked up to me and said "Ball". He had built a track from hotwheels to run some metal balls down from a game that we had at home. I just want to thank you for the excitement on his and our face from his enjoyment of your sculpture.